SBI Software delivers interactive, visual, and fully customizable reporting with real-time data. Better data leads to better decision making and a clear path forward for growers. Analytics from SBI provides customers instant access to sales history analysis and operational awareness. In reporting, efficiency is key. The automation of data-driven and customer-centric analytics will help businesses of all sizes get right to the point, and get back to business. 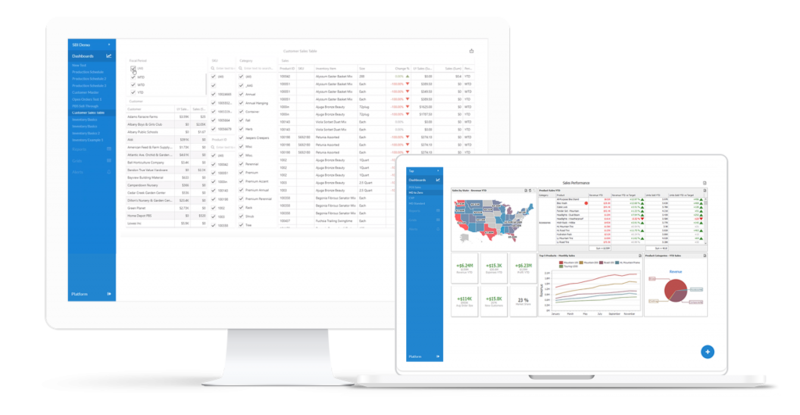 The ability to build custom reports and bolt on custom data sources puts business owners in the driver’s seat. Business Intelligence enables human decisions & actions based on facts. The more robust the business analytics, the more effectively a business will become. SBI Software is the leading fully-integrated software package, configurable to support your wholesale or retail growing operation, from seed to sale. SBI supplies clients with the largest tech and support team dedicated to growers. Founded in 2001, SBI offers expert software solutions for box store growers, young plant growers, and wholesale growers of all sizes throughout the world.